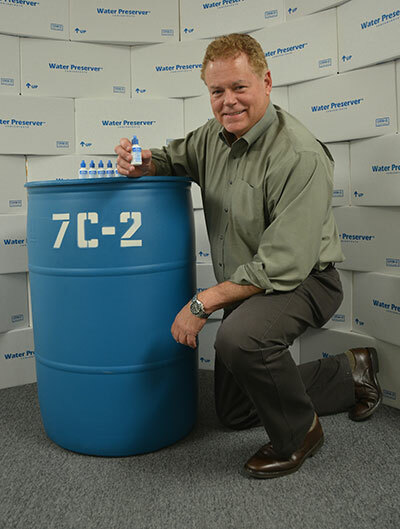 7C's was founded by 1989 by Craig Carter, for the purpose of developing and marketing a "water preservation" product, later to be known as Water Preserver Concentrate™. Craig spent many years as Manager of Safety & Health and Environmental Affairs for a division of a major pharmaceutical company. He holds undergraduate degrees in chemistry, pre-med. and psychology and a Master of Science degree in human physiology. One of the safety and health challenges he faced was preparing the company's manufacturing plants and employees for unexpected emergencies and natural disasters such as earthquakes. Beginning in the early 1980's he was one of the first in the U.S. to show corporate heads a budgetary justification for a comprehensive emergency mitigation and preparedness program. The emergency preparation process involved years of employee safety and emergency response team training, as well as the procurement of large quantities of equipment and supplies, including water. Each plant needed to be as self-sufficient as possible, to protect and shelter a large number of employees and to provide for rapid resumption of business after any given emergency. It became obvious that maintaining a large supply of emergency water, for drinking, cooking, sanitation, medical and first aid uses was critically important. However, the necessity of replacing the water supply every 3-6 months to prevent contamination proved that maintaining a safe water supply was a time-consuming and costly procedure. With the help of other scientists and laboratories, Craig began experimenting with different methods of storing water and using various chemical additives to prolong the shelf life of stored water. In 1985, he began his first long-term storage test by blending a number of high-purity ingredients into what was later to become the original formula for Water Preserver™ Concentrate. Using the new compound, he prepared a batch of water with the mixture and put the mixture in storage. After a period of 2 years and 4 months, samples of the water were taken and analyzed in a laboratory. The results were promising. After 29 months, analysis showed the stored water still met the standards for fresh drinking water! The testing continued for another 5 years on the original batch of water and a control batch of untreated tap water. The water was stored in specially designed containers called WaterCube™and samples were taken periodically to check water quality. Year after year, the results were astounding. While the untreated control samples showed high levels of bacterial contamination, the treated water continued to meet the standards for fresh drinking water! Based on years of product testing results, applications for registration of the product were finally filed with the U.S. EPA, and California Dept. of Food and Agriculture (now Cal/EPA). Approvals were granted in 1991 to market the product for 5-year water storage. EPA required product testing to continue for a total of 10 years, with laboratory analysis periodically submitted to them for review. A final progress report was submitted in October 1995, showing the original water sample still meeting current drinking water standards! Used worldwide, Water Preserver™ is the #1 best selling and most widely-recommended water storage product. Craig Carter is the Founder of 7C's Safety and Environmental. He's also the creator of WaterPreserver. 7C's Safety and Environmental, Inc.